Cheese and beer is well-trodden ground for a reason. It works. As a gateway food and beer pairing it’s perfect; grab an armful of different cheeses, throw a few beers in the fridge and an hour or two later you can sit down to your own little pairing experiment. With very little effort, expense or knowledge it’s possible to yield some fantastic results; whilst at the same time there’s sufficient variety and variation to keep the experienced pairer happy too. It may be far from an original idea, but it’s something I find myself continually returning to. Beer can compliment cheese by way of either contrast or harmony. Sharp, acidic, tangy cheese demands a beer that will stand up to it; contrasted with anything less than bracing bitterness and punchy hops, the cheese will become too dominant, wrestling the beer to the ground and stealing its lunch money. 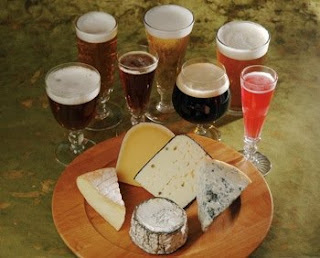 Equally, adjectives like nutty, sweet, creamy, velvety and buttery can all be used to describe both beer and cheese. Identify characteristics like these in each partner and then bring them together in a harmonious marriage for delicious results. For some it will be easy to dismiss all this as the product of an overactive imagination. The hyperbolic ramblings of a beer lover gone too far; wrapped up in the romance of beer, its history and accessibility, the gross neglect it’s shown as a gastronomic delight. Easy only if that someone is yet to experience the true treat of a perfect beer and food pairing. As Oliver says, when you absolutely nail it, you lose the ability to distinguish between the two component parts; a new flavour is born where one bleeds seamlessly into the other. Good pairings are easy to come by, apply a little knowledge, make some careful decisions, and you’re pretty likely to get there. You’ll probably wonder what all the fuss is about, but you’ll get there. It’s the great pairings that’re worth chasing though, the ones that take a bit of teasing out, a bit of perfecting over time and a fair slice of luck. These are the ones that don’t come about very often but make it all worth while when they do, revelatory pairings that instantly secure themselves a spot on the favourites list, these are the pairings that Oliver sings about. Bell's Hopslam is a beer I’ve only ever had once. I had it with Comté, a hard French cheese made with milk only from the Montbeliard cow. The cheese has a wonderful sweetness which is amplified by the honey used to brew Hopslam; the fruity west coast American hops grab hold of the fruitiness in the cheese and a nutty, nutmeg like quality sits aside the grainy, malty, bitter finish to the beer. The words I write here will never do the combination justice, but hopefully they will inspire others to try the pairing. 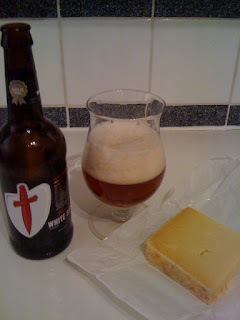 Another favourite is to pair an English IPA, like White Shield, with traditional English cheddar like Montgomery's. I’ve written about this before; for me it’s an all time classic because it pairs two fantastic English products to achieve a result that’s simple delicious. Many a time I’ve enjoyed an evening meal of torn bread, slabs of strong cheddar and a glass of foamy White Shield. People say that sometimes less is more, and in this instance I definitely agree. A self contained plateful of delicious, comforting nourishment that wouldn’t benefit from any further addition, beautiful simplicity. The natural creamy sweetness of the cheese will compliment the sweet maltyness of the beer. A traditional truckle of aged cheddar will have an earthy, wild, mustard like quality to it; a perfect match for the spicy, peppery, dusty notes associated with English hop varieties like Goldings. Applewood smoked cheddar is a bulky, boisterous, bruiser of a cheese. Its texture so densely thick and creamy that it leaves a film on the roof of your mouth and across the width of your tongue; that creaminess moves into woody smoke and then a finish that builds into a lingering tang. Like David to Goliath, Meantime Wheat is a beer of complete contrast. Its spritzy, highly carbonated, light-weight little feet come rushing in, they dance all over your mouth, lifting that heavy film, washing it all away. Choc full of fruity banana and clove esters; the beer will soothe the cheese and bring out its hidden sweetness. In Beer Companion, Michael Jackson describes Orval as having “an earthy, leathery, oily aroma, in which some tasters detect sage, and an intensely dry acidic palate”. It’s the presence of brettanomyces in the bottle however that provides the point of harmony between Orval and a creamy goat’s cheese. The beer with its dirty, horsy, wild notes and the cheese with mousy, musty ripeness; the pair shake hands over funk whilst the acidic dry nature of Orval cuts the creamy, fattiness of the cheese. That picture at the top has set my heart-rate up a notch or two. I may need some alone time with it. Mmm cheese and beer! Great post. I love to experiment with different cheese and beers. It's good to get a bunch of bottles in the fridge and 3-4 cheeses on the table and just to nibble while you drink - you'll always find a few expected and brilliant matches! US IIPA is great with cheese. There's something about the bold, bitter hops and the creamy, rich fat of the cheese which play off each other wonderfully. Like the idea of the contrast between smoked cheese and wheat beer. I often find wheat beers have a little phenolic quality to them so perhaps that helps to act as a bridging flavour? One of my favourites at the moment is adding a few glugs of a brown ale (or similar) to a cheese sauce - it adds a great depth of flavour! I think I might stock up on some cheeses and put some bottles in the fridge... this has made me hungry! Love cheese and beer matching, used to do it fairly frequently whilst living in Soton (benefits of having waitrose nearby and a bottle shop just up the road) Though less able to get good cheese in the middle of Northern Ireland. Need to blog about it sometime. Nothing beats a good cheese and beer pairing.